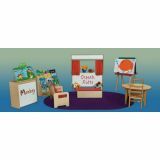 This set includes everything for an infant room. 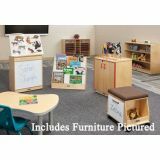 This layout includes 5 Clear View Cribs, one with the steel brace for fire drill evacuation; 1 Step Up Changing Cabinet; 2 Crib Dressers; 1 Adult Rocking Chair; and 1 Hang on the Wall Diaper Storage. 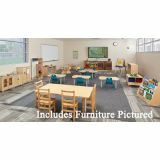 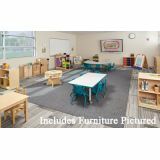 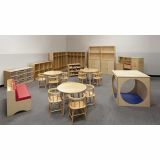 Set includes 9-Cubby Storage Unit, Reading Couch, Privacy Cube & Mat, Small Block Storage with Beginner Block Set, Kitchen Combo, Low Cubby, 2 Bases and Decks Storage Units, 2 5-Person Coat Lockers, 3 Table & Chair Sets, and 6 extra Chairs!